At a time when our first amendment rights are being questioned and even denied, this extraordinary story is timely. It begins in a small southern town with a letter to the editor of the newspaper by a citizen requesting access to public records. It ends years later at the Fourth Circuit Court of Appeals in Richmond Virginia. Those who pick up the gauntlet and press forward in the pursuit to strengthen their school system will discover, as did I, that a vast number of people and organizations stand ready to support their efforts, especially the newspapers. And even though their voices of dissent may disturb the status quo, as Supreme Court Justice Hughes wrote, such a right must be acknowledged even if it "...induces a condition of unrest, creates dissatisfaction with conditions as they are, and...stirs people to anger. Public employees have a right to question their supervisors regarding matters of public concern. And citizens of these United States have not only the right but the responsibility to question authority and protect free speech by exercising it. We are moving into dangerous times. We must stand firm for the Constitution of the United States of America and in so doing, of democracy itself. In the words of Albert Einstein, "The strength of the Constitution lies entirely in the determination of each citizen to defend it." And so it has been with hundreds of public school teachers who discovered that when they criticized their school system, they experienced retaliation in the form of scurrilous attacks and physical threats. It happened to author Maggi Hall, beginning with a simple letter to the editor of her local newspaper. Little did Hall realize that her complaints criticizing her school district's inappropriate expenditure of funds would result in harassment, intimidation, and termination. The covert attempt to punish her included the use of public funds to follow and photograph her-a well-planned conspiracy that included school board members and administrators, a minister, strangers, supposed friends, and fellow teachers. AFFIRMED: Teachers as Citizens illustrates Hall's struggle to keep tax money where it belongs-for the education of our children. I should have heeded my husband's apprehension and our friends' advice, but I wanted that house. Because Ron and I were public school teachers and supported public education, we ignored our friends' warnings and enrolled our daughters in Marion's school system. A year later I transferred to the Marion system from Florence where I had developed two educational programs: the itinerant learning disabilities program and a self-contained middle school class for emotionally disturbed juvenile delinquents. In Marion, I was assigned to two schools as a learning disabilities clinician. Within weeks of my transfer, my first encounter with the establishment made me acutely aware that the warnings of our friends were accurate. Almost four decades since the landmark decision in Pickering v. Board of Education, 1968, many teachers still cannot criticize their school system without fear of retaliation. When author Maggi Hall, a veteran public school teacher, wrote a letter to the newspaper in Marion County, South Carolina, criticizing her school district, she didn't realize that one day she would be called upon to defend the cornerstone of democracy itself-the First Amendment. 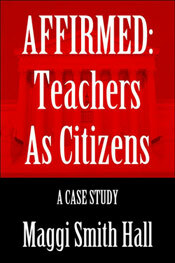 AFFIRMED: Teachers as Citizens is her amazing story of determination. Maggi Hall taught school in South Carolina for over two decades. She is the recipient of numerous environmental awards and the author of four books. Hall owns a real estate firm in DeLand, Florida that has been instrumental in rehabilitating a blighted downtown residential neighborhood. Several of Hall's awards include being named the 2006 "Florida City Citizen of the Year" and the 2006 "Florida Trust for Historic Preservation Individual Achievement Award." Execution-This is a story that exudes emotional power on every page-something this reviewer has never written about any other book assigned to him. It is not one that can be easily set aside. Although the execution is a straightforward chronological approach to the events, how could it unfold otherwise? The inclusion of so many citations from newspapers, the author's letters to the editor, as well as the end notes for attribution, make this book extremely well structured and organized. Quality of Writing-The writing is generally superb, but as is the case with people who have a lot to say and want to say it all right now, the author can be her own worst enemy. Author Credentials-Because Ms. Smith Hall documents her material so thoroughly-and this is HER story, after all-it is doubtful that anyone else could be as well qualified to write it. What a fortunate event THAT is. Bad things happen to everyone every day; most of them can't write as well as Ms. Hall, so we never hear about them. General Comments-Book reviewers hardly ever get to read a book they literally can't put down, so this one is a rare treat. I have worked in the educational publishing arena for more than 30 years, and this book has to be one of the most interesting I've come across.